Celebrating the life of Lorenso Bustos Jr.
Be the first to share your favorite memory, photo or story of Lorenso. This memorial page is dedicated for family, friends and future generations to celebrate the life of their loved one. 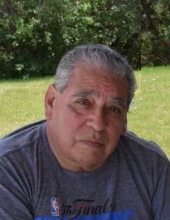 Obituary for Lorenso Bustos Jr.
Mr. Lorenso Bustos Jr. passed peacefully on April 10, 2019 with his loving family by his side. He is preceded in death by his parents Lorenso and Concepcion Bustos and his sister Virginia Ruiz. He is survived by his wife Elena, sons; Lorenso Bustos III and Nicholas Bustos, daughters; Tricia Cantu and Araceli Lopez, along with 6 grandchildren and one brother Anselmo Bustos. To send flowers or a remembrance gift to the family of Lorenso Bustos Jr., please visit our Tribute Store. "Email Address" would like to share the life celebration of Lorenso Bustos Jr.. Click on the "link" to go to share a favorite memory or leave a condolence message for the family.